Gertie's New Blog for Better Sewing: Accoutrements: Style and Beauty Picks! Accoutrements: Style and Beauty Picks! This is a new little feature that I've been cooking up. As you may have noticed, I'm more of a laid-back (lazy?) vintage-lover. I don't do my hair in elaborate retro styles or wear girdles and sky-high heels every day. But lately I've started taking more of an interest in the art of "doing" vintage: the hair, the makeup, the shoes, the accessories. Accoutrements will be a new series of posts about products and tools that I discover as I go. * I hope you enjoy it! 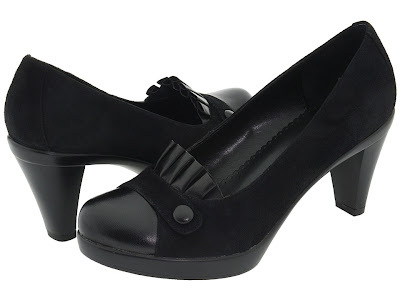 I've been obsessing about 40s-style shoes, like the babydoll pumps and high-heeled loafers you see on pattern envelopes. It's hard to find pumps with a good thick heel like these, but I've been searching! My latest purchase was this pair. Aren't they cute and oh-so-40s? I love the little pleated detail on the vamp. But the best part is that the low platform on these makes it feel like you're wearing flats! They are amazingly comfortable. They're made by Bella Vita, and I've noticed a couple others to put on my wish list from this company, like these peep-toe platform slingbacks and these cute perforated leather pumps. Red lips are crucial to the retro look, and I'm a sworn MAC Russian Red devotee. Matte lipstick can be drying, though, especially in the winter. 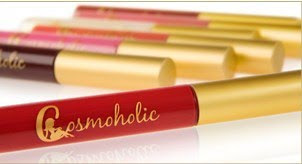 I came across this cool "liquid lipstick" from Cosmoholic in an airport drugstore, and it's a lovely winter alternative. Rockstar Red is a great true red color. It goes on with lots of gloss and the pigment lasts a long time. Plus, it smells like vanilla and feels good on chapped lips. Casey's fantastic videos on a faux-bang look and a 40s-style updo. This cool tutorial on pin curls. I love the tip to set them with styling putty! This is an easy "fake" victory roll that came out very nicely for me. That's it for this edition of Accoutrements! Come back for more tips as I work on my rocking retro look! *I suppose I should mention that these are personal picks, not advertisments of any sort. Though, if anyone wants to throw some cash or swag at me to review products . . . let's talk! Ahhhhhh. Pin curls. My grandmother used to set my hair in pin curls. I loved it. Sad that women don't "do" their hair any more. We spend way too much money at the salon having it done for us. Oh, and cake type mascara, applied with a wet brush! There are a couple of brands still on the market. I love your new shoes! They look like a perfect compromise between old and new. Thank you for this! I was on the train last night, admiring a woman's hair and wondering how in the world she did it! Now I know.... thanks! Those shoes are great! 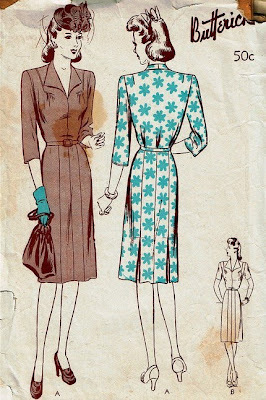 (It's funny how often I lust after the shoes on pattern envelopes as well as the patterns themselves.) Sadly, no matter how many varieties of true red lipstick I try, I always end up looking clownish, as I'm ultra pale -- reddish will have to do for me! Well, sometimes it is the accessories that make the outfit. I am trying to figure out how to make a muff purse to go with my new winter coat as although the coat looks great, it seems to be lacking a certain 'something'. I used to wear pin curls as a little girl. My mom had me do that because it was the way her mother taught her and it was cheaper than rollers. Somewhere along the line, we eventually got some sponge rollers. Boy did that hurt when sleeping. but the pain was worth the beautiful curls the whole next day. Then came the perms in my teenage years, the 80's, you know? Now I let my hair hang straight. Although gray hair does have a bit of a wave naturally, or would you call that wiry? Yea, I finally have some natural wave, albeit not very much. These will fun and interesting posts. You are the most inventive person I know. You might find these of interest. Oh! I can't wait. That will be awesome! We spend way too much money at the salon having it done for us.